Rieker Perfect 43711 women's velcro shoes. 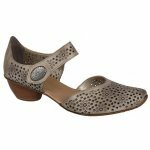 It features a beautiful flower print across the perforated smooth leather upper which adds a feminine touch to a classic design. Rieker's Anti-stress technology provides shock absorption and lasting comfort, making it ideal for all day wear. The velcro fastening allows for adjustability and a secure fit, while allowing the shoe to be put on and taken off with ease. A fabulous shoe that can be worn as an every casual shoe, but is smart enough to dress up for special occasions. Rieker perfect is a timeless design that sits upon a 40mm block heel that adds height as well as stability.